I didn't think the windows at the Chanel boutique on 57th Street were very special when I saw them last Sunday. The embroidery on the dresses and jackets, however, was divine. 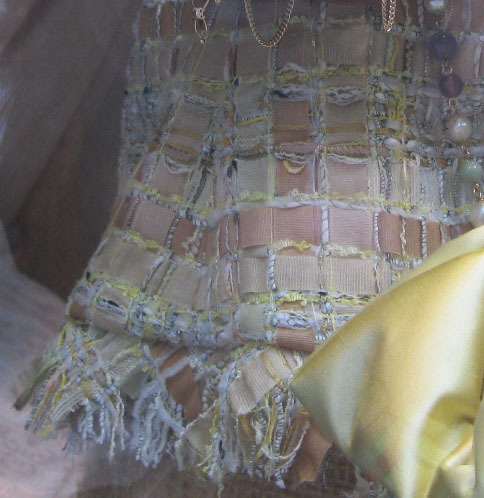 These particular pieces had different colored grosgrain ribbons woven through the fabric. The photos don't do the colors justice, which were a wonderful combination of butterscotch, cream, yellow and beige, shot through with bits of silver. Outstanding. Consider me obsessed with Lesage, the atelier that does embroidery for Chanel. Look at those grosgrain ribbons woven throughout. Hello, I'm dying of love! Notice how the ribbon is such a perfect match from the jacket front to the sleeve where it meets at the seam that it flows from one to the other with no break. Dear Chanel seamstresses, please teach me how to sew like this. 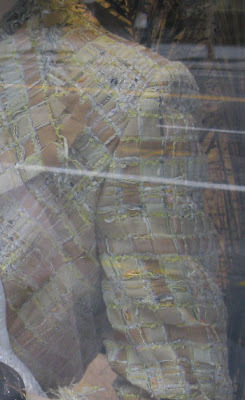 This shot shows the different tones of the jacket better. I adore how the yellow makes the whole thing pop. I'm still loving the gold disco bag, which I featured in April. 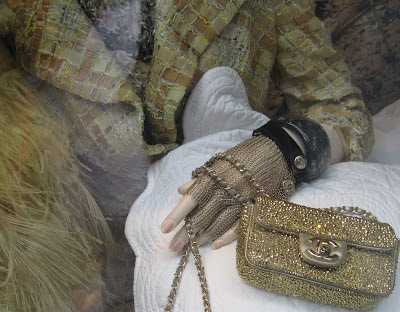 Thank you my dear JIll to let me peep into Chanel´s shop window from the south of Spain. Love the windows...they are stunning! Thanks for the tour! I also want you to know how much I look forward to your comments on my site...thanks for being there! Look forward to hearing your review on the book you are currently reading!! Beautiful detailing on the dress and jacket. I got the Isabella Blow book at the library but didn't read it because I didn't get to it in time. How are you liking it? That is some jacket! The ribbons! The colours! I think people don't look out for that kind of attention to detail anymore in garments, sadly. We're all getting so used to seeing mass made things so poorly made. Chanel may be expensive but there are some good reasons why. Top class tailoring being one of them! OMG--what a work of art. The craftsmanship is just unbelievable in this day of machine sewing. And I agree; the choice of colors is exquisite. Thanks so much for this close up view!! A fabric of ribbons...simply amazine. Hi Sacramento, I realized I love it when people post pictures on their blog of windows I can't get to, usually in Paris. So now I'm thinking of making this a regular feature. Hi Pam, how is the wedding stuff going? I have been so busy this week, I think your daughter may be getting married this weekend? I will stop by and find out. And yes, I need to write some reviews of the books I'm featuring! Hi Adrienne! The Isabella Blow book is really good, it's better than I expected it to be. I'm getting a real sense of the unique nature of her work as a fashion stylist/mentor to Alexander McQueen and Philip Treacy, and of her somewhat privileged, but also tragic, upbringing. I'm not getting a sense of her as a true depressive though, I've read that McQueen had highs and lows throughout his life, but so far with Isabella it seems she was in a great mood most of the time, making her suicide even more baffling. I hope to do a more in-depth review later. Hi Veshoevius! I'm with you, the tailoring on the Chanel jacket is so good. I hope to own one of these beauties one day, but it will definitely be vintage because even the 'cheapest' jacket I tried on last fall at the Chanel boutique was $4,200! Ouch ouch ouch! Hi Paula, you know with your coloring, I think this particular jacket would look stunning on you. I can see it in my mind! Hi Terri, I'm glad you're back, I've missed you! Wouldn't it be so great to see how this fabric was made? But I've read in sewing magazines that Chanel does NOT like to have journalists of any kind in their workrooms. Too bad.